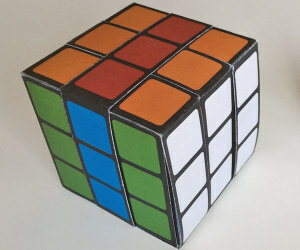 How can you fit twelve months on a cube with six faces? Watch the video and download the template to find out how. It is surprisingly easy to make this printable paper puzzle box and 2016 desk calendar. Click here to view the 2017 calendar. This printable 2016 desk calendar comes with a matching pop-up gift label and a sliding red sleeve which serves both to show the current week, and to keep the box shut. Click here to get the 2017 desk calendar! How does the Desk Calendar work? The desk calendar puzzle box mechanism is simple to operate, but counterintuitive. Start by opening the box. Easy, right? 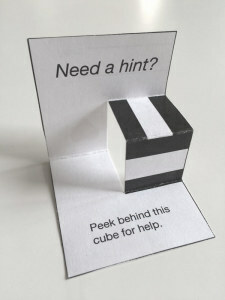 All you need to do is rotate the two parts of the box on the hinge. But then KEEP ON ROTATING the parts in the same direction! The two parts rotate around each other without ever becoming detached. The hinge itself moves around the box edges, and finally ends up on the opposite rim. Meanwhile, the pattern on the box has been magically replaced by a completely different pattern. If you would like to purchase the 2016 calendar, please contact me. Or get the latest version here. The Desk calendar template comes with illustrated instructions, but this video tutorial will show you how to make it.